Fujifilm X-A3: To buy or not to buy? Have you ever had that lingering itch to buy something? For the last three weeks, I have. I was looking at the Apple Watch Series 2 but I decided it wasn’t really my style. I just got the super cheap Xiaomi Band 2. Now, I’ve been looking for a camera that will suit my needs as a blogger. The candidate: the Fujifilm X-A3. See sample pics taken using Fujifilm X-A3 after the jump! Background: I didn’t know where to start so I emailed Henry’s Professional and asked for recommendations considering my needs. Henry’s suggested this model from Fujifilm. 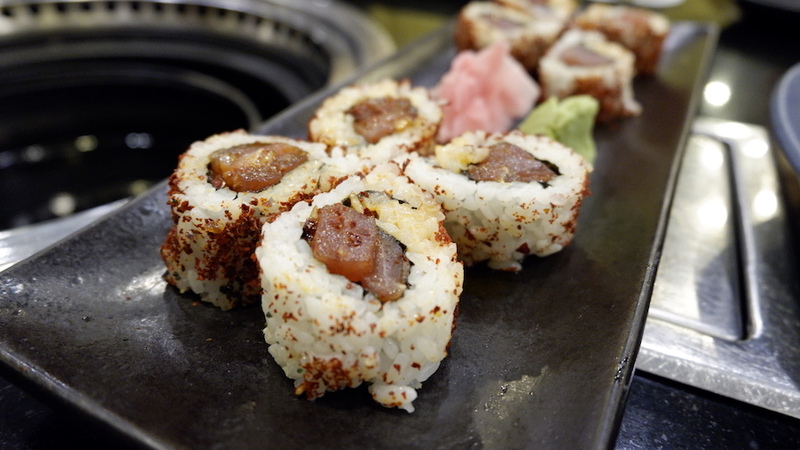 Spicy Maki from Ogetsu! The picture was taken using a Fujifilm X-A3. I would have bought the X-A3 right away based on how it looked (and if I had so much money). It has this retro feel brought by the faux leather covering. It’s available in three colors too! Aside from the 24 M APS-C Sensor, my favorite feature is that you can shoot pictures just by touching the screen. (Yes, the LCD screen is touch-screen!) Just choose the object you want the camera to focus and touch. Et voila! I’m also amused by the LCD screen as it can be tilted 180-degrees so you can take a selfie. I’m not much of a selfie person but I do travel alone a lot. So yeah, this feature may come handy. Videos can also be recorded in HD (1280 x 720 60p). Hmm… The only problem is it costs Php 39,990 (with a free Instax printer in some stores). I’m so torn but I do enjoy this stage of purchasing something. Luckily, my cousin lent me his Fujifilm X-A3. This is sort of a trial period before I’ll decide if I want to buy the camera or not. I also tried video-recording. IT WAS AWESOME! Here are some of the photos (resized) I took in the past 2 days. Wahhh! I don’t really know much about cameras and photography so I need help… HELP! Is the Fujifilm X-A3 worth it? Or should I just stick to my iPhone and GoPro? OR should I just prolong this itch until it goes away? What do you think? Previous post:New Season Alert! Asia's Next Top Model Cycle 5 Coming Soon!